"The Most faithful representation of pure nylon string tones that we have found in any amplified guitar. The playability and tonal integrity of this guitar even when amplified at high volume is simply unparalleled"
Nathan Sinclair is half of Electrifying guitar duo Aires Linares. Their original compositions rely heavily upon strong pulsating rhythms that draw on influences from Spanish, rock, hip-hop, Latin, and modern jazz music. These influences are also reflected in their modern interpretations of classic popular repertoire. Formed in 2011, Aires Linares sees the coming together of two distinct musical talents. 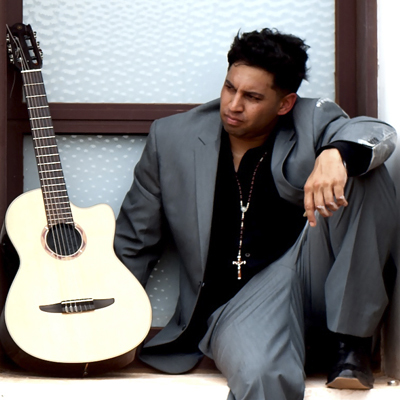 Brandon Lewis comes from a Latin jazz background, studying this discipline at the Victorian College of the Arts, and further pursuing his passion for this genre of music through his involvement in various Latin bands over the past 20 years. Nathan Sinclair’s musical education comes from a more classical Spanish background which has seem him perform internationally both as a soloist and with orchestras and garner prizes in major guitar competitions around the world. From this combined wealth of musical experience, Aires Linares deliver stirring performances that exhibit an unparalleled level of technical virtuosity at the heart of which lies a deep emotive core.